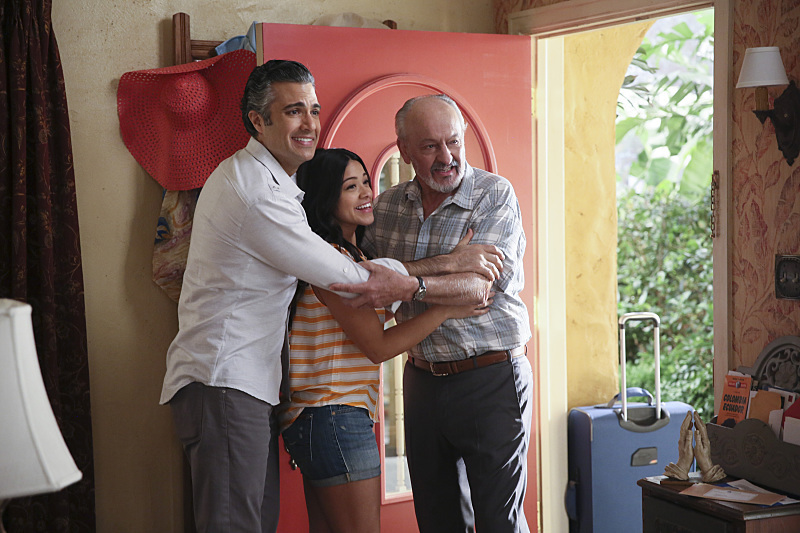 It was all relative last night on Jane the Virgin. As our favorite and all-knowing narrator reminded us this week, “hardship isn’t a competition.” It’s something that’s very easy to forget when having a bad day. Anger, moodiness, disappointment or sadness are the kind of emotions that make us feel like the world revolves around us and all the misfortune we just experienced, when in fact, there could be other people having worse days, say, for instance, getting drugged by your biological mother who abandoned you as a kid and who you just discovered is an international crime boss. 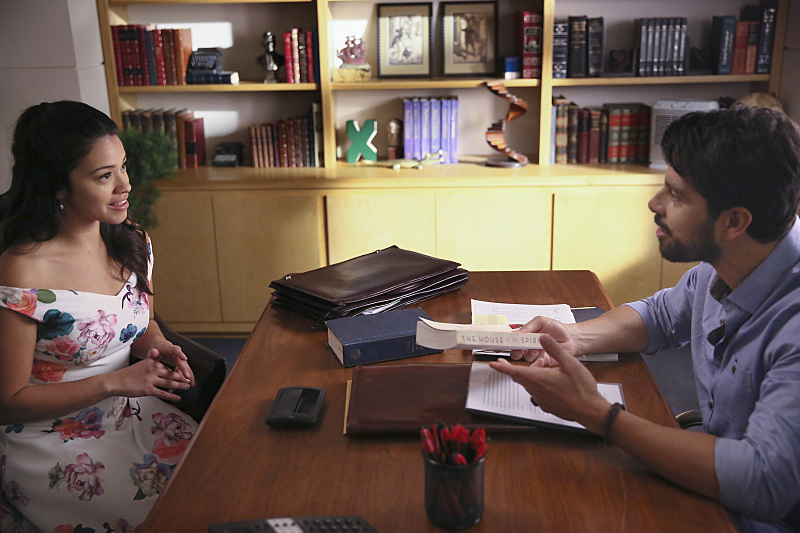 Clearly, Jane the Virgin fell back into its rhythm after last week’s lukewarm return. After weeks of writer’s block, Jane finally gets the inspiration to write. She comes up some of her best work for her thesis and unfortunately loses it all when Mateo crawls – for the first time! – and accidentally pulls the power cord connected to Jane’s laptop, which then knocks a glass of orange juice on top of it. Oops. Oddly enough, the broken computer leads to Jane being convinced by her best friend to get back into the dating game. Rogelio hopes to make things right between his divorcing parents. His father is happy to be out of the closet and in love with another man. His mother is having a hard time dealing with being alone, so Rogelio feels compelled to rehire her as his manager. It turns out to be an utter disaster as her demands on the telenovela set are angering the cast and crew, and Rogelio is on the receiving end of the backlash. 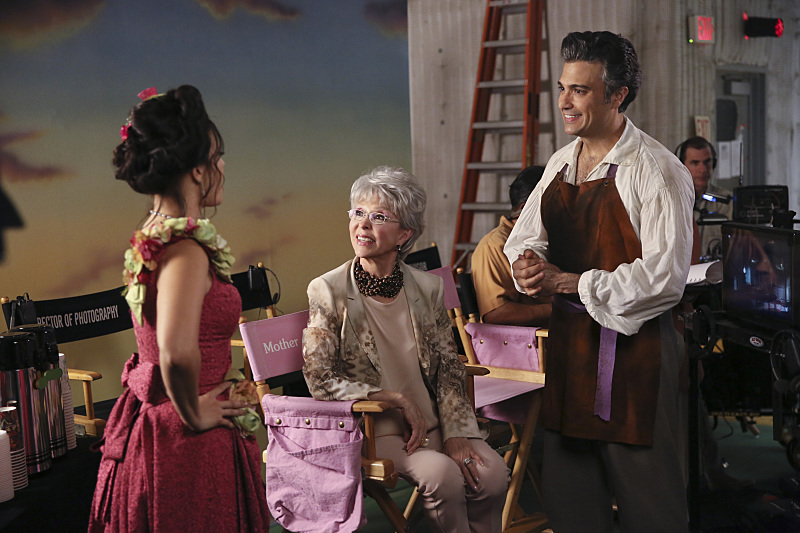 Xiomara, who initially took glee from Rogelio’s mother’s personal life taking a dive, finds herself convincing Rogelio to not fire his mother. He eventually does though, and Xo shares a sweet scene with his mother, who finally acknowledges Xo as being a good person, worthy of Rogelio. Dating is a struggle for Jane as she can’t help but envision her dates with her son Mateo. She’s mentally speeding through way too many steps which sends some of her “Cynder” dates running for the hills, except for guest star Diego Boneta, a skater boy she met at the computer repair shop. Boneta’s character manages to charm Jane long enough to earn a passionate kiss, only for it to end with Jane running for the hills. He apparently has a girlfriend. The whole experience makes Jane realize that she’s more of a relationship person, not a dating kind. This entire sequence parodized the online dating experience wonderfully, showing off how complicated, shallow and unsatisfying it can be swiping left or right, figuring out who is real match or not. Michael makes a huge discovery in the Mutter investigation, finding the data chip that he had traded for Mateo with Nadine. A few flashbacks made him realize that Nadine had implanted the chip in Michael during one of their many meetups in Mexico before she died. The chip was in Michael’s leg the entire time – this would only be plausible on Jane the Virgin, you guys. This Mutter investigation is losing steam fast, and I’m barely invested in it like I was with the Sin Rostro drama of last season. “Chapter Thirty-Two” didn’t waste time letting us know that Rafael was alright, just drugged unconscious before he could alert the authorities about his mother being Mutter – they already knew anyway. It’s a shock for Rafael, but he’s sidetracked by a pregnancy scare with Petra. The doctor orders her on bed rest, and after firing two nurses, Rafael moves his office to Petra’s suite to watch over her. The two grow a little closer, picking out names for their twin daughters. Petra continues to be one of the most complex characters on the show, and seeing this softer side of her is always interesting. Jane ends up having a hot dream about her writing professor, played by Adam Rodriguez. (Can you blame her?) Now that’s she’s nursing a crush, I can’t wait to see what happens when she sees him next. It’s sure to be hilarious and a little embarrassing. The most intriguing part of the ending is seeing Alba look up a name on the internet. Who is that person and how is she connected to him? After all the online dating teasing Jane gave her grandmother earlier, it’s not unreasonable to assume the subject of her search is a past love. No theory this week, besides Alba’s internet search being someone she loved before her husband.